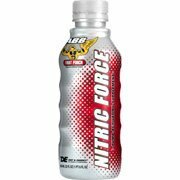 Nitric Force Energy Drink is made by American Body Building. It is marketed as a fitness/body building supplement. See our complete review of ABB products below. How Does Nitric Force Energy Drink Compare? Nitric Force Energy Drink contains 9.09 mgs of caffeine per fluid ounce (30.74mg/100 ml).